In this lesson MP4-Video (approx. 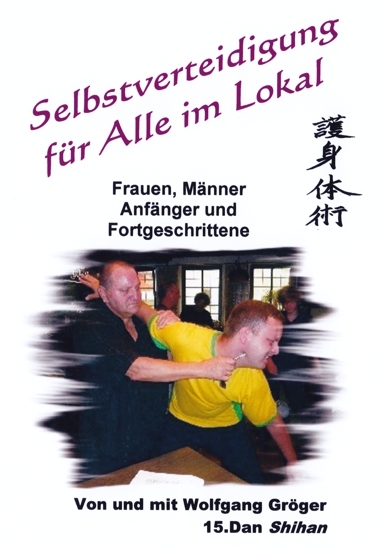 53 minutes) graduate engineer Wolfgang Gröger Shihan 15th Dan (Menkyo Kaiden Kugyo Happo Hiken) Budo-Taijutsu (Bujinkan) and 12th Dan Goshin-Taijutsu (IAWO) understandably demonstrates contemporary and practical self-defence, in the bar, in and near the car. He is a well-known expert for self-defence. Each defence technique and situation is demonstrated with and without everyday objects (keys, umbrella, chair, salt and pepper shaker, news paper, spray, mobile phone and so on). Contents: Defence techniques against molestation, strangling attacks, attacks with a bottle, baseball bat, gun and knife in the bar, on the staircase, at the restroom, also in and near the car.